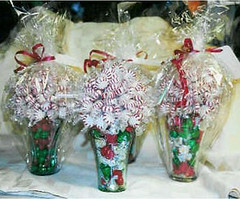 Shared by my aunt, Amy, several years ago, Candy Cups have become a gift-giving standard for me. 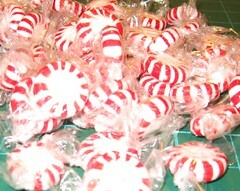 I’ve made them for Christmas and birthdays and with all sorts of candy. 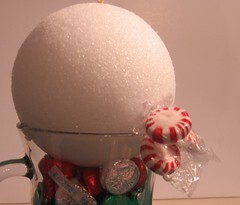 They’re easy, inexpensive and make gorgeous gifts for the hard-to-shop for. 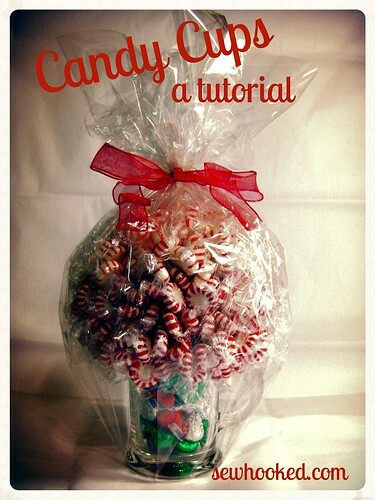 Think teachers, friends and anyone that likes candy. 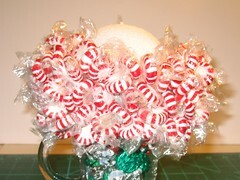 Have a diabetic in your life? 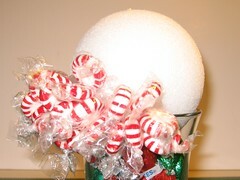 Sugar-free candy works, too! 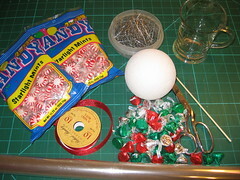 Once all your supplies are gathered, it’ll take you about an hour to make one candy cup. 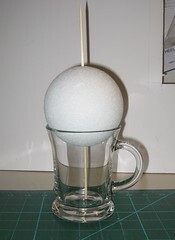 Push the bamboo skewer into the Styrofoam ball, all the way through the top. 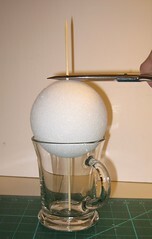 Put it in the glass to and push down until the ball is snug in the glass. 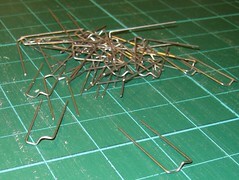 Snip off the excess skewer with your scissors. 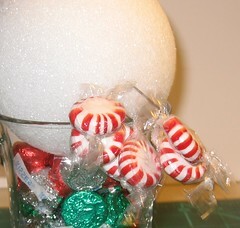 With the skewer still in the glass, fill the bottom of with candy. 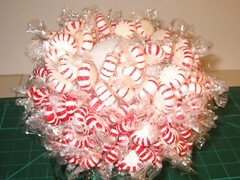 Ideas are M&Ms, Hershey Kisses or Peppermints (though you could really use any candy). 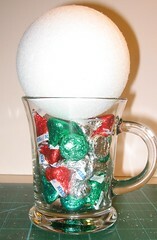 Another option is shredded paper, but the candy on the ball will make the cup top-heavy, so having a heavier filler keeps it from tipping over and gives the gifted a sweet bonus. 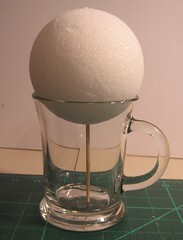 Place a small dot of hot melt glue on either side of the rim of the cup. 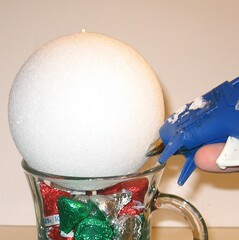 Gently press styrofoam ball onto glue, holding in place until it sets. 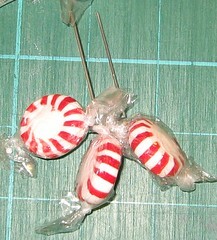 Use greening pins to add candy to ball by poking pins through the loose end near the twist of the candy wrapper. 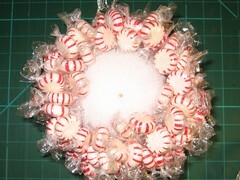 Depending on the candy, you can get two or three on each pin. Start at the bottom and work up to the top, going in circles. 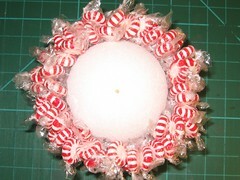 Fill in any holes with more candy & greening pins. Final round complete, all the holes filled in. 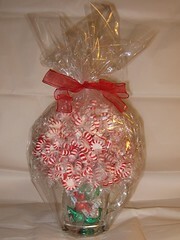 Wrap in cellophane and embellish with a bow or ribbon. 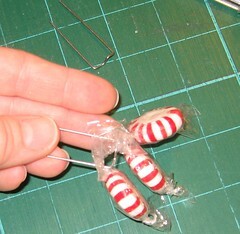 The cellophane is optional, but it provides insurance that your candy will get from point “A” to point “B” intact. 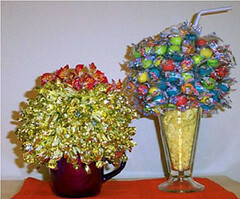 Variations by Amy Maxey – toffee coffee & bubble gum soda glass. 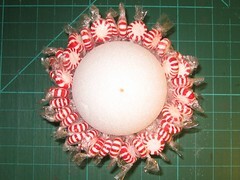 This is part of my “Way Back Craft” series; patterns, crafts, tutorials and general crafty memories before the days of this blog. 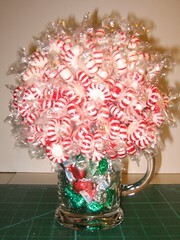 This entry was posted in Christmas, hand crafts, Holidays, way back craft and tagged birthday, candy, Christmas, cup, easy, free, gift, how to, tutorial on December 22, 2008 by Jennifer Ofenstein. 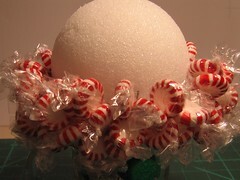 That is so cute. 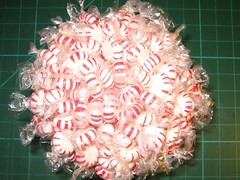 I don’t know anyone who wouldn’t like that one.